Whether you’re a seasoned ShortStack user, or have built only a handful of Campaigns, there are a few ShortStack features you might not know about. Some of them are hidden in plain sight, while some you might have to dig for. But they all have one thing in common: They’ll make Campaign-building easier and make your Campaigns more powerful. 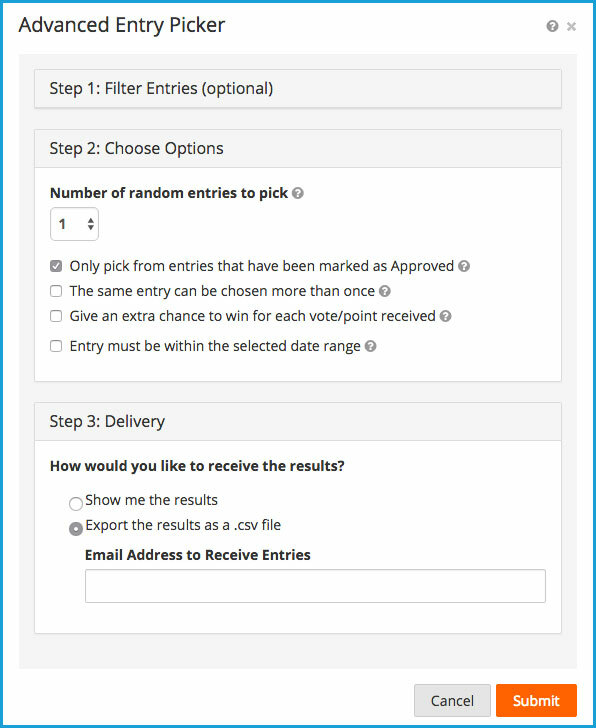 Using ShortStack’s Pick Random Entries tool will ensure a winner is chosen at random. Choosing and notifying a winner is one of the most fun parts of hosting a contest or sweepstakes, and letting entrants know about how you’ll choose a winner ahead of time will make it easier for you to wrap up your contest without any drama. There are two big reasons to tell your entrants up front how the winner will be chosen: 1) so people don’t accuse you of choosing a winner unfairly and, 2) so that entrants can’t cheat. 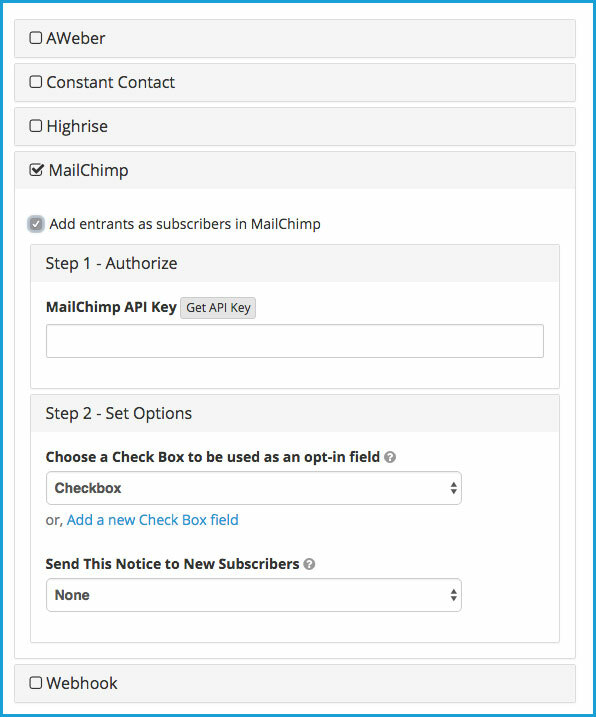 If you already use email software, such as MailChimp, Constant Contact or AWeber Email Marketing, or a CRM platform, such as Highrise, you can easily have all the entries to your ShortStack Campaigns sent directly to the other platforms you use. You can also use Webhooks to send information from your entries to another service you use. Display Instagram photos and videos in your Campaign. 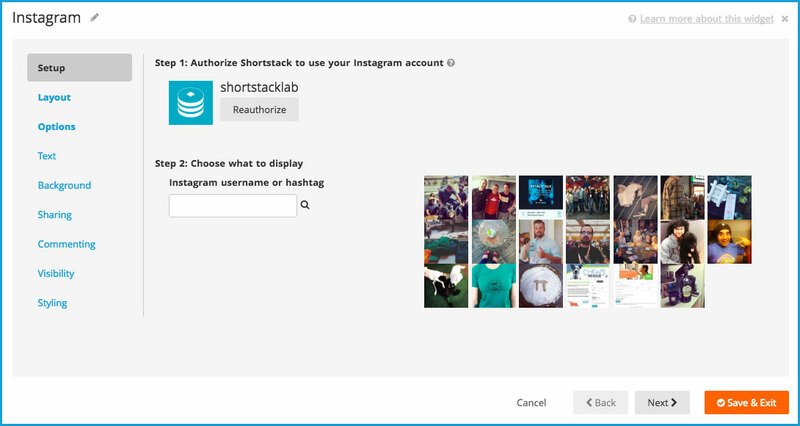 ShortStack’s Instagram Widget will display photos/videos from a single Instagram account, or those that match a hashtag search. Using the ShortStack Image Widget, you can also use Canva, to design beautiful, designer-quality graphics to use for headers or other parts of your Campaigns. 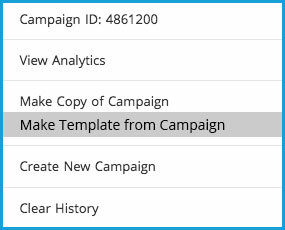 Agencies that build lots of campaigns for a variety of clients will appreciate being able to organize the Campaigns using simple tags. 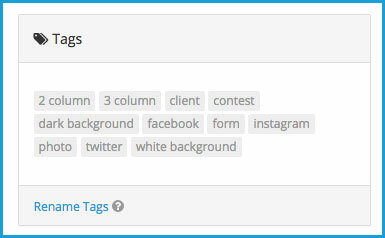 You can organize by client or by Campaign type. 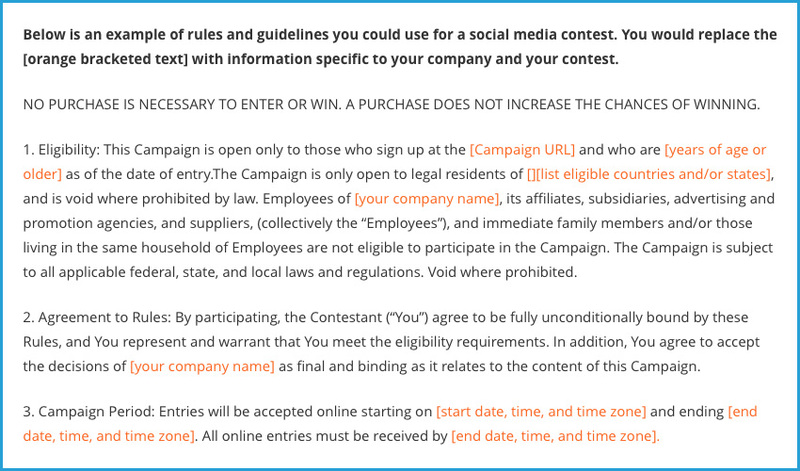 If you’re planning to host a contest, you’ll want to spell out the rules and regulations ahead of time and post them for anyone who enters your contest to read. “How do I write rules for my contest?” is a question we get asked a lot, which is one reason we created this handy template. There may be times when you want to let a client or someone else you work with access certain parts of your Campaign. ShortStack account owners can set up a ShortStack Team account and then grant access to specific Campaigns, databases, media, plus custom templates, themes and snippets. 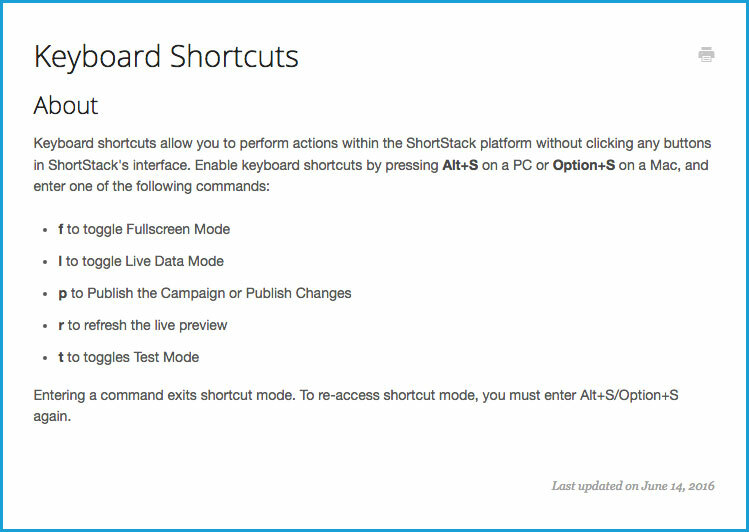 As with all keyboard shortcuts, ShortStack’s make certain tasks faster. For example, when you’re toggling in and out of test mode, you can use the keyboard instead of your mouse. You can use a shortcut to get to Fullscreen Mode, and to publish a Campaign, or to publish changes. Keyboard shortcuts are also handy when you’re editing pop-ups of hidden widgets: If you turn test mode off, you can pull up your popup; when you turn it back on you can edit the popup right there. Here’s the full list of keyboard shortcuts. Since these days the majority of internet users are accessing the web using mobile devices, you want to make sure your Campaigns look beautiful on smartphones and tablets, and that your forms are easy to view on mobile devices. In ShortStack, just go to the ruler that sits across the top of the Campaign Builder and click it to adjust the preview view. ShortStack Campaigns are responsive, and will adjust to the device your users are on, but this will help you see exactly what they will see using a variety of devices. If you like our software and tell your friends, we’ll say “thanks for the referral” by putting some cash in your pocket. Here’s how it works: When you refer colleagues, readers, followers, etc. 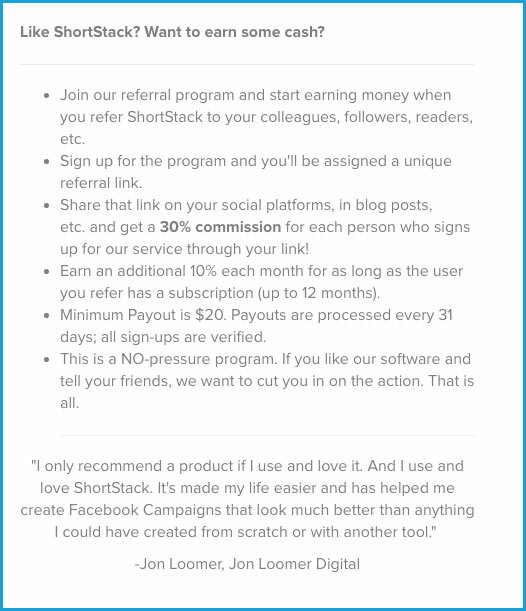 to ShortStack and they sign up for a paid account, you’ll get a 30 percent commission. Earn an additional 10 percent each month for as long as the user you refer has a subscription (for up to 12 months). 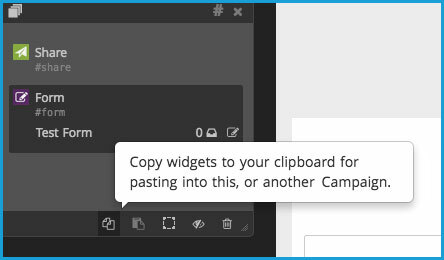 By copying widgets, you can use them again and again. If you’ve spent time writing custom code that you want to use in more than one Campaign, simply copy and paste it like you would any other part of a Campaign. If you’ve built a Campaign that you think you might want to use again in the future, you can turn it into your own template to use again and again. Rather than starting from scratch, you’ll have a template with all the elements you want, ready to update and publish.